Visit Twickenham Richmond upon Thames, Greater London and the surrounding villages and stay in b and b, hotel or vacation rental accommodation provided by BedPosts members. The town of Twickenham on the River Thames is 10 miles from London's centre. Visit interesting and historical mansions: York House, Marble Hill and Strawberry Hill House. The game of Rugby Football Union is headquartered here. Twickenham also has the national Rugby Stadium. 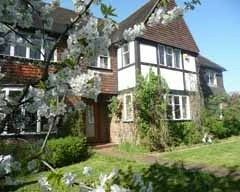 If you seek accommodation near Twickenham in Richmond upon Thames, Greater London you have come to the website of a “club” of providers who offer affordable quality accommodation around UK in hotels, bed and breakfasts, guesthouses, inns, and restaurants plus self-catering cottages and apartments .